I learn best by doing. I like to see and hear, but I truly gain an understanding when I can feel, touch, and manipulate things. Sometimes my inability to understand some things until I can see and feel them baffles my husband. He obviously learns things differently than I. These playdough mats would have been perfect for the 3-year old version of me. 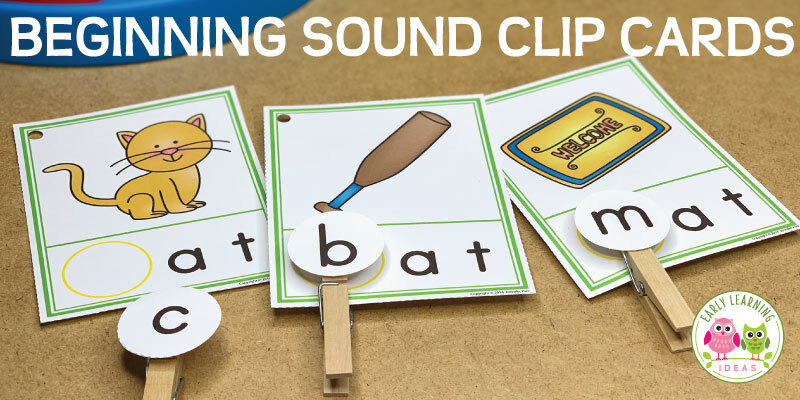 They provide a great way to teach early math concepts in a multi-sensory way. The 1-20 half-sheet number playdough mats come in several different styles and can be printed in full color and black and white. The ten frame mats feature a large numeral on the top with a ten frame on the bottom. Laminate the mats so that playdough does not stick to them. Playdough is such a great learning tool. It provides sensory input, it helps kids build their fine motor skills, and it just feels good to squish it between your fingers. If you want to make your own playdough, try my quick playdough recipe. One style of ten frame mats has colored dots on the ten frame. Then kids can use coils or blobs of dough to trace the number and learn to recognize it’s shape. Children can also cover the dots with counters and/or blobs of playdough as they practice counting and one-to-one correspondence. 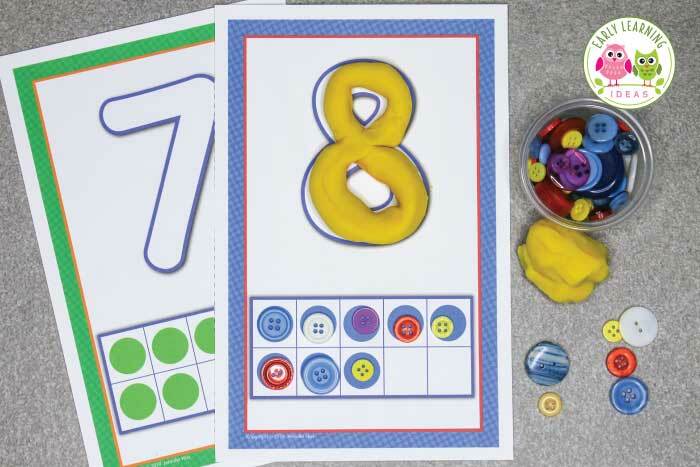 To create more of a challenge, you can print the number playdough mats without dots in the ten frames. The third style of number playdough mat included in the set does not contain ten frames. There is just a nice blank area beside each number so that kids can add counters or blobs of dough. I like the black and white versions of the mats because give me the opportunity to get a little creative. 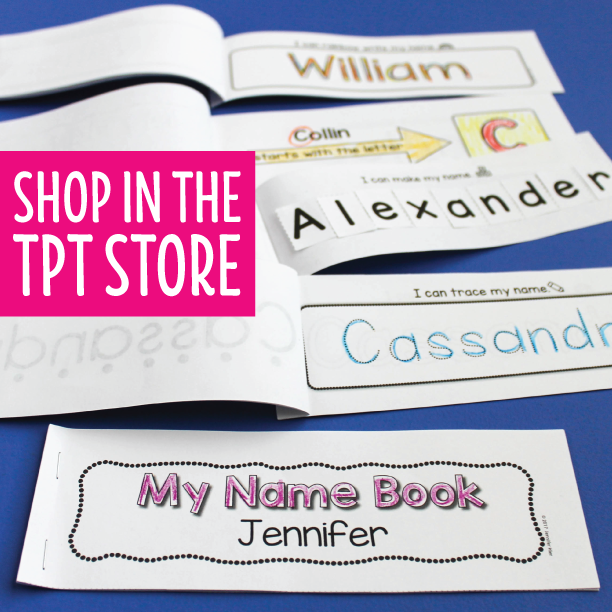 You can print them onto different colors of paper or cardstock to coordinate with playdough, counters, or theme. 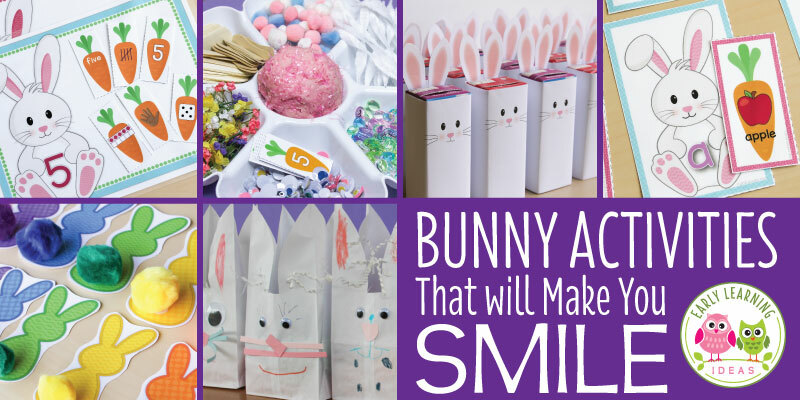 They are a great addition to a playdough tray or invitation to play. Finger Tracing – Kids can work on number formation and recognition by tracing the large numeral with their pointer finger. Rainbow writing– Use markers or crayons to practice tracing the numerals. Compare quantities – Place the appropriate quantity of counters or blobs of playdough on two different number mats. Determine which mat has more and which has less. Coloring pages. Use the black and white versions of the color mats as coloring pages. Kids can draw the appropriate quantity of objects. 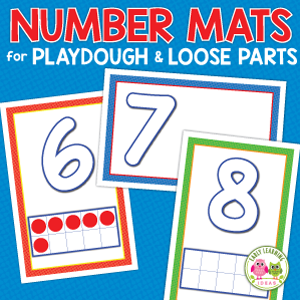 To purchase the 1-20 Number Playdough Mats from my store, click on the image below. I bet that you will find many of your kids are like me….they learn best by doing. 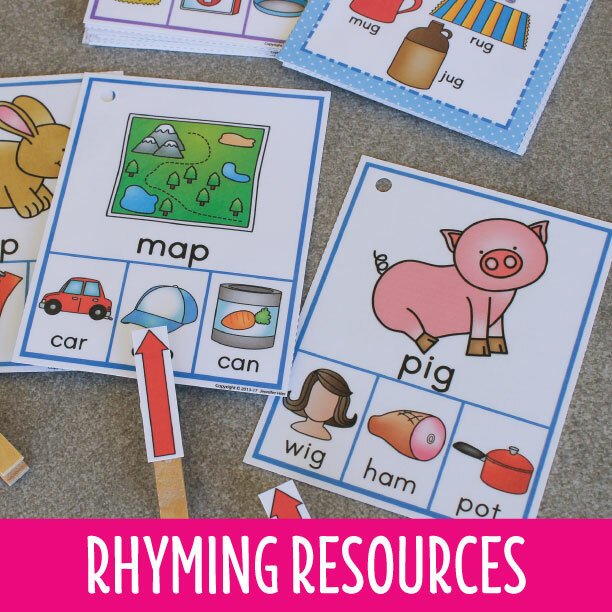 I hope that you enjoy using some of these ideas to keep their little hands busy moving and their brains busy learning.